Limitations This CD82 antibody is available for research use only. Cluster of Differentiation 82, also called KAI1, is a protein that in humans encoded by the CD82 gene. The gene is mapped to 11p11.2. This metastasis suppressor gene product is a membrane glycoprotein that is a member of the transmembrane 4 superfamily. Expression has been shown to be downregulated in tumor progression of human cancers and can be activated by p53 through a consensus binding sequence in the promoter. The expression of CD82 appears to be correlated with lymph node metastasis in esophageal squamous cell carcinoma (ESCC). And overexpression can suppress tumor invasiveness and metastatic potential by inducing MMP9 inactivation via upregulation of TIMP1. The stated application concentrations are suggested starting amounts. Titration of the CD82 antibody may be required due to differences in protocols and secondary/substrate sensitivity. 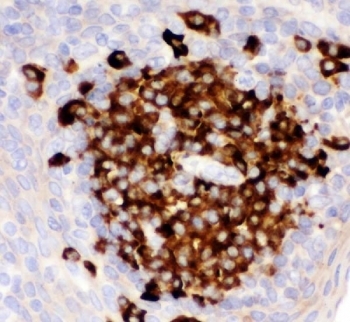 Humanpartial recombinant protein (AA 98-267) was used as the immunogen for this CD82 antibody. After reconstitution, the CD82 antibody can be stored for up to one month at 4oC. For long-term, aliquot and store at -20oC. Avoid repeated freezing and thawing. Your bulk quote request has been submitted successfully!